The center of our Galaxy has been intensely studied for many years, but it still harbors surprises for scientists. 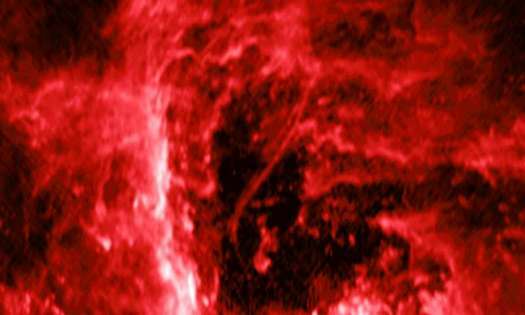 A snake-like structure lurking near our galaxy’s supermassive black hole is the latest discovery to tantalize astronomers. In 2016, Farhad Yusef-Zadeh of Northwestern University reported the discovery of an unusual filament near the center of the Milky Way Galaxy using the NSF’s Karl G. Jansky Very Large Array (VLA). 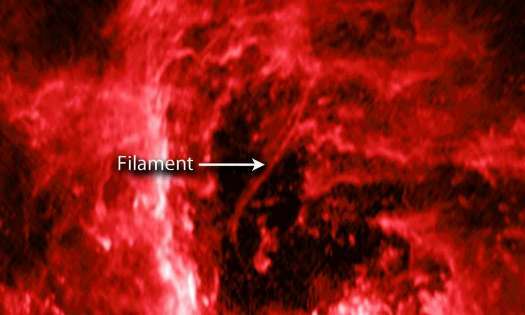 The filament is about 2.3 light years long and curves around to point at the supermassive black hole, called Sagittarius A* (Sgr A*), located in the Galactic center. Now, another team of astronomers has employed a pioneering technique to produce the highest-quality image yet obtained of this curved object. The researchers have considered three main explanations for the filament. The first is that it is caused by high-speed particles kicked away from the supermassive black hole. A spinning black hole coupled with gas spiraling inwards can produce a rotating, vertical tower of magnetic field that approaches or even threads the event horizon, the point of no return for infalling matter. Within this tower, particles would be sped up and produce radio emission as they spiral around magnetic field lines and stream away from the black hole. The second, more fantastic, possibility is that the filament is a cosmic string, theoretical, as-yet undetected objects that are long, extremely thin objects that carry mass and electric currents. Previously, theorists had predicted that cosmic strings, if they exist, would migrate to the centers of galaxies. If the string moves close enough to the central black hole it might be captured once a portion of the string crosses the event horizon. The final option is that the position and the direction of the filament aligning with the black hole are merely coincidental superpositions, and there is no real association between the two. This would imply it is like dozens of other known filaments found farther away from the center of the Galaxy. However, such a coincidence is quite unlikely to happen by chance. Each of the scenarios being investigated would provide intriguing insight if proven true. For example, if the filament is caused by particles being ejected by Sgr A*, this would reveal important information about the magnetic field in this special environment, showing that it is smooth and orderly rather than chaotic. The second option, the cosmic string, would provide the first evidence for a highly speculative idea with profound implications for understanding gravity, space-time and the Universe itself. Evidence for the idea that particles are being magnetically kicked away from the black hole would come from observing that particles further away from Sgr A* are less energetic than those close in. A test for the cosmic string idea will capitalize on the prediction by theorists that the string should move at a high fraction of the speed of light. Follow-up observations with the VLA should be able to detect the corresponding shift in position of the filament. Even if the filament is not physically tied to Sgr A*, the bend in the shape of this filament is still unusual. The bend coincides with, and could be caused by, a shock wave, akin to a sonic boom, where the blast wave from an exploded star is colliding with the powerful winds blowing away from massive stars surrounding the central black hole.